The La Sportiva Women's Trango S EVO GTX Mountaineering Boot features the weather protection of Gore-Tex and the low weight you demand in the mountains. 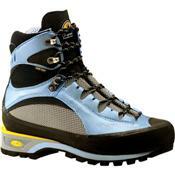 By using a combination of synthetic leather and waterproof Cordura, La Sportiva managed to make these sporty boots very light and tough enough for the alpine world. The Trango EVO Boots also include Vibram soles for serious on-snow performance and newmatic crampon compatibility when you get to the ice.